A bad night's sleep can affect your productivity like nothing else. And spending evenings in front of a bright computer screen does absolutely nothing to make you sleep better at night. The bright light emitted by the computer screen tricks your brain into thinking that it's still daytime -- not a good thing at 11 p.m. when your gray matter should be preparing itself for a good night's sleep. Redshift and F.lux provide a simple fix for this problem. The utility adjusts the color temperature of the screen according to the time of the day at your specific geographical location. So as it's getting later (and darker) outside, the color temperature of your screen becomes warmer, making your brain (correctly) think that it's already evening. Usually this is enough to make Redshift do its job, but the utility sports other parameters you can tweak. Check the project's website for further info. If you don't fancy Redshift, then you might want to give F.lux a try. A packaged version of the utility for Ubuntu is available in a separate PPA, and you can install F.lux on your machine using the following commands. Once up and running, the utility adds an indicator applet. Click on it, and choose the Preferences item to configure the settings. 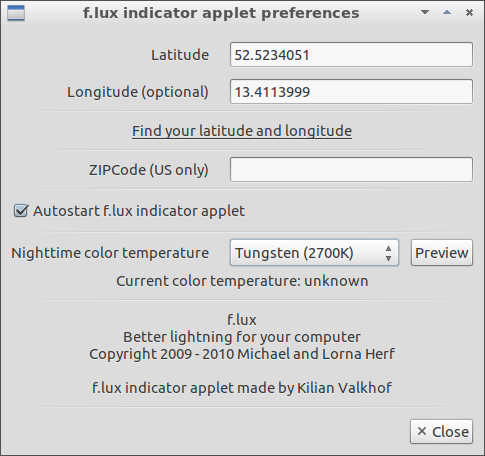 All of the available options in the Preferences panel are self-explanatory, so you shouldn't have problems configuring F.lux. This is an awesome utility. I'm using it as I type this (it's completely dark out right now where I am), and it doesn't look as bad as I expected. Kudos to the developers.